Punjab BJP today in strong words condemned the statement of Aam Aadmi Party’s Bholath MLA, Sukhpal Singh Khaira, wherein he had stated that RSS, VHP and BJP might have a hand in the murder of a church priest in Ludhiana. Coming dwn heavily on Khaira, Punjab BJP vice-president Harjit Singh Grewal and party secretary Vineet Joshi termed the allegations as baseless and false. Addressing the media here today the BJP leaders said that BJP’s ideology was Nationalist while that of the Aam Aadmi Party is Separatist. Lambasting Khaira the senior BJP leaders said, “By pinning the blame of Pastor Sultan Masih on the BJP, RSS and the VHP, the newly-elected Leader of Opposition has made a mockery of himself. RSS is an organization which respects all religions and its leaders have sacrificed their lives for the nation. The RSS has lost many of its leaders in such incidents of violence. Be it senior RSS leader Jagdish Gagneja, Mata Chand Kaur, Amit Sharma, Durga Gupta, Satpal or Ramesh - all have lost their lives in the same manner and circumstances as Sultan Masih. 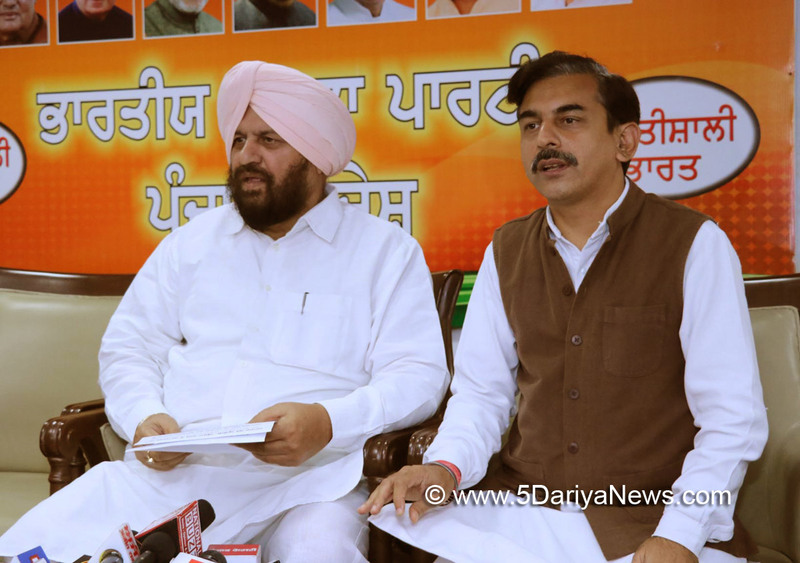 Given this backdrop, leveling such allegations against the RSS simply reflects the metal bankruptcy of Khaira”.Challenging Khaira, Grewal and Joshi asked him to provide evidence in support of his accusations or tender an apology.Grewal and Joshi reminded Khaira that the RSS has a history of sacrifices and in Punjab alone the RSS lost 27 of its swamsevaks in a terrorist attack on a RSS Shakha in Moga on 25th June, 1989.“Hundreds of BJP leaders and workers in Punjab have sacrificed their lives. Former party president Babu Hitabhilashi, Shambu Prasad from Patiala, Harbans Lal Khanna from Amritsar, Ramprakash Prabhakar from Kadian, Gurbachan Singh Patanga and Dr. Dharamvir Singh Bhatia from Jaiton, Khushiram Sharma, Prakash Chand Dua and Tarsem Singh Bahar from Ludhiana are some prominent leaders who laid down their lives for Punjab. Besides, BJP’s former national vice-president Late Baldev Prakash and current member of the BJP’s national executive, Dr. Baldev Chawla have survived terrorist attacks on them”, they said.